for the shows this summer with Santana - as both are "jam bands" and play for hours individually, i'm assuming both bands will have to cut their sets shorter than normal. i've seen ABB at the Beacon a few times and they played for three hours at least... there's no way they can do that for these shows, correct? will they play a more "hit" oriented show? i'm curious because i know most of these venues have a curfew. also, who is opening for who? is ABB headlining? which means Santana will go on first? also, does anyone know if they will be doing "Meet and Greets" on this tour?! 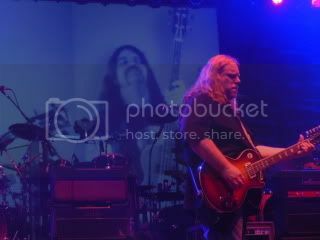 Summer girl, you are right that the shows will not be as long as n Evening With The Allmanbrothers Bros at the Beacon. I figure each band will get 75 to 90 minutes, certainly nothing more than 2 hours. When the ABB plays the sheds or plays a double bill like this, the set list will be somewhat hit oriented but will still have cool things. You might get an instrumental like Les Brers as an opener, you might get a cover like Gilded Splinters. It is highly likely you will see members of each band sit in with the other band!!!! Very cool. I believe they are alternating roles as opener / closer each date. At these gigs, lawn seating is usually inexpensive. thanks so much Jim. I actually was lucky enough to get great seats for the PNC Arts Center show in NJ - but honestly, the lawn seats would be great, because in July in can get so hot down closer to the stage... really looking forward to it.. I would predict that each band will play AT LEAST 90 mins. Probably more. I think this is a co-headlining tour, and I've never seen the ABB play less than 90 mins. Santana is going on last at PNC. i'll be at that show. the allmans are up first on the 25th. gate says 6:30 and i will report back with the actual start time. i bet they play from 7 - 9 and santana from 9:30 - 11:30. or it actually might be a 6:#0 start. if you want to trade lawn for your seats, i'll pay the difference! how do you guys know ABB is going on first at PNC?!!! Sully, can't trade my tickets, i'm just hoping it won't be 100 degress that day!! who knows or can guess the potential set list??!! can't wait for the show at spac. it was publicly announced a while back who would open and close on which dates. as this is my favorite thing to do during the summer (abb at pnc), i pay close attention! we'll be tailgating as soon as they let us in. come join us. any word on Audience recordings for these shows? I hope the Allmans play first at the SPAC show, so that I can get outta there after the Allmans set. Cool, just checked and does appear the Allmans will play first. Can anybody confirm this? Just my opinion, but anybody who doesn't stick around to see a Santana show after they have already paid to be there is really missing out. Even if you aren't a big fan, it's worth catching a few songs for free. Maybe you have some reason you need to leave early, in which case nevermind. But as of 2010, which was the last time I saw them live, Santana is worth seeing. Maybe not the unstoppable juggernaut they were in their prime, but still one of the best live bands on Earth. Don't forget that there is a good chance Derek will jam with Santana, and judging from the tapes when the Derek Trucks Band opened for Santana a few years ago, that is worth the price of admission. They never play a hit oriented show. They will just cut out some of the longer jams that usually take place during the second set. Haven't seen the official listing of opening/closing on this tour anywhere on this site. Apologies if it's posted somewhere. Post from Carlos Santana's site below. ABB closing Darien Lake, Jones Beach, and Hartford. Santana co-headlining with The Allman Brothers Band! Carlos and The Allman Brothers Band will co-headline a few dates around the Northeast this summer! With some cross pollination from Santana's percussion section, we could have a much more interesting drum solo than usual. And it would be nice to see Marc get a chance to bring his game to Santana's. This is what's most appealing to me about this series of shows. Beat me to it -- made my points better than I would've! Tuesday night - Jones Beach - can't get here fast enough. I assumed it too, but to hear it from Steph makes it as close to fact as possible at this point. It should be interesting. It should be phenomenal.